This article is about the South Atlantic island group. For the Portuguese explorer, see Tristão da Cunha. Tristan da Cunha (/ˌtrɪstən də ˈkuːn(j)ə/), colloquially Tristan, is both a remote group of volcanic islands in the south Atlantic Ocean and the main island of that group. It is the most remote inhabited archipelago in the world, lying approximately 1,511 miles (2,432 km) off the coast of Cape Town in South Africa, 1,343 miles (2,161 km) from Saint Helena and 2,166 miles (3,486 km) off the coast from the Falkland Islands. 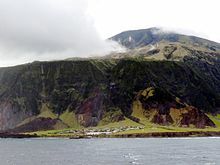 The territory consists of the main island, Tristan da Cunha, which has a diameter of roughly 11 kilometres (6.8 mi) and an area of 98 square kilometres (38 sq mi), the smaller, uninhabited Nightingale Islands, and the wildlife reserves of Inaccessible Island and Gough Island. As of October 2018[update], the main island has 250 permanent inhabitants who all carry British Overseas Territories citizenship. The other islands are uninhabited, except for the personnel of a weather station on Gough Island. Territorial song: "The Cutty Wren"
.sh or .uk can be used. Tristan da Cunha is part of the British Overseas Territory of Saint Helena, Ascension and Tristan da Cunha. This includes Saint Helena and also near-equatorial Ascension Island, which lies some 1,741 miles (2,802 km) to the north of Tristan. There is no airstrip of any kind on the main island, meaning that the only way of travelling in and out of Tristan is by boat, a six-day trip from South Africa. The islands were first recorded as sighted in 1506 by Portuguese explorer Tristão da Cunha, though rough seas prevented a landing. He named the main island after himself, Ilha de Tristão da Cunha. It was later anglicised from its earliest mention on British Admiralty charts to Tristan da Cunha Island. Some sources state that the Portuguese made the first landing in 1520, when the Lás Rafael captained by Ruy Vaz Pereira called at Tristan for water. The first undisputed landing was made on 7 February 1643 by the crew of the Dutch East India Company ship Heemstede, captained by Claes Gerritsz Bierenbroodspot. The Dutch stopped at the island four more times in the next 25 years, and in 1656 created the first rough charts of the archipelago. The first full survey of the archipelago was made by crew of the French corvette Heure du Berger in 1767. The first scientific exploration was conducted by French naturalist Louis-Marie Aubert du Petit-Thouars, who stayed on the island for three days in January 1793, during a French mercantile expedition from Brest, France to Mauritius. Thouars made botanical collections and reported traces of human habitation, including fireplaces and overgrown gardens, probably left by Dutch explorers in the 17th century. The first permanent settler was Jonathan Lambert of Salem, Massachusetts, United States, who moved to the island in December 1810 with two other men, and later a third. Lambert publicly declared the islands his property and named them the Islands of Refreshment. Three of the four men died in 1812; however, the survivor among the original three permanent settlers, Thomas Currie (or Tommaso Corri) remained as a farmer on the island. In 1816, the United Kingdom annexed the islands, making them a dependency of the Cape Colony in South Africa. This was explained as a measure to prevent the islands' use as a base for any attempt to free Napoleon Bonaparte from his prison on Saint Helena. The occupation also prevented the United States from using Tristan da Cunha as a base for naval cruisers, as it had during the War of 1812. On the fifteenth of July, the snow-clad mountains of Tristan da Cunha appeared, lighted by a brilliant morning-sun, and towering to a height estimated at between nine and ten thousand feet." The islands were occupied by a garrison of British Marines, and a civilian population gradually grew. Berwick stopped there on 25 March 1824 and reported that it had a population of twenty-two men and three women. Whalers set up bases on the islands for operations in the Southern Atlantic. However, the opening of the Suez Canal in 1869, together with the gradual transition from sailing ships to coal-fired steam ships, increased the isolation of the islands, which were no longer needed as a stopping port for lengthy sail voyages, or for shelter for journeys from Europe to East Asia. In 1867, Prince Alfred, Duke of Edinburgh and second son of Queen Victoria, visited the islands. The main settlement, Edinburgh of the Seven Seas, was named in honour of his visit. On 15 October 1873, the Royal Navy scientific survey vessel HMS Challenger docked at Tristan to conduct geographic and zoological surveys on Tristan, Inaccessible Island and the Nightingale Islands. In his log, Captain George Nares recorded a total of fifteen families and eighty-six individuals living on the island. From December 1937 to March 1938, a Norwegian party made a dedicated scientific expedition to Tristan da Cunha, and sociologist Peter A. Munch extensively documented island culture—he would later revisit the island in 1964–65. The island was also visited in 1938 by W. Robert Foran, reporting for the National Geographic Society; his account, Tristan da Cunha, Isles of Contentment, was published in November 1938. On 12 January 1938 by letters patent, Britain declared the islands a dependency of Saint Helena, creating the British Crown Colony of Saint Helena and Dependencies, which also included Ascension Island. Gough and Inaccessible Islands, a UNESCO World Heritage Site. During the Second World War, Tristan was commissioned by the Royal Navy as the stone frigate HMS Atlantic Isle and used as a secret signals intelligence station to monitor Nazi U-boats (which were required to maintain radio contact) and shipping movements in the South Atlantic Ocean. This weather and radio station led to extensive new infrastructure being built on the island, including a school, a hospital, and a cash-based general store. After the war, development continued, as the island's first canning factory expanding the availability of paid employment in 1949. Prince Philip, Duke of Edinburgh, the Queen's consort, visited the islands in 1957 as part of a world tour on board the royal yacht HMY Britannia. On 10 October 1961, the eruption of Queen Mary's Peak forced the evacuation of the entire population of 264 individuals. Evacuees took to the water in open boats and sailed to uninhabited Nightingale Island, where they were picked up by a Dutch passenger ship that took them via Cape Town to Britain. The islanders arrived in the UK to a big press reception, and were settled in an old Royal Air Force camp near Calshot, Hampshire. The following year a Royal Society expedition reported that Edinburgh of the Seven Seas had survived the eruption. Most families returned in 1963. Gough Island was inscribed as a UNESCO World Heritage Site in 1995, then named "Gough Island Wildlife Reserve". The Site was extended in 2004 to include the neighbouring Inaccessible Island and renamed Gough and Inaccessible Islands, with its marine zone extended from 3 to 12 nautical miles. The Gough and Inaccessible Islands were declared as separate Ramsar sites—wetland sites designated to be of international importance—on 20 November 2008. On 23 May 2001, the islands were hit by an extratropical cyclone that generated winds up to 190 kilometres per hour (120 mph). A number of structures were severely damaged, and numerous cattle were killed, prompting emergency aid provided by the British government. In 2005, the islands were given a United Kingdom post code (TDCU 1ZZ), to make it easier for the residents to order goods online. On 13 February 2008, a fire destroyed the island's four power generators and fish canning factory, severely disrupting the economy. On 14 March 2008, new generators were installed and power restored, and a new factory opened in July 2009. While the replacement factory was built, M/V Kelso came to the island as a factory ship. The St. Helena, Ascension, and Tristan da Cunha Constitution Order 2009 reorganized Tristan da Cunha as a constituent of the new British Overseas Territory of Saint Helena, Ascension and Tristan da Cunha, giving Tristan and Ascension equal status with Saint Helena. Inaccessible Island and the Nightingale Islands are 35 kilometres (22 mi) SW by W and SSW away from the main island, respectively, whereas Gough Island is 395 kilometres (245 mi) SSE. The main island is generally mountainous. The only flat area is on the north-west coast, which is the location of the only settlement, Edinburgh of the Seven Seas. The highest point is the summit of a volcano called Queen Mary's Peak at an elevation of 2,062 metres (6,765 ft), high enough to develop snow cover in winter. The other islands of the group are uninhabited, except for a weather station with a staff of six on Gough Island, which has been operated by South Africa since 1956 and has been at its present location at Transvaal Bay on the southeast coast since 1963. The archipelago has a wet oceanic climate under the Köppen system, with mild temperatures and very limited sunshine but consistent moderate-to-heavy rainfall due to the persistent westerly winds. 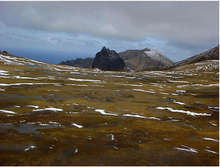 Under the Trewartha classification, Tristan da Cunha has a humid subtropical climate due to the lack of cold weather. The number of rainy days is comparable to the Aleutian Islands at a much higher latitude in the northern hemisphere, while sunshine hours are comparable to Juneau, Alaska, 20° farther from the equator. Frost is unknown below elevations of 500 metres (1,600 ft), and summer temperatures are similarly mild, never reaching 25 °C (77 °F). Sandy Point on the east coast is reputed to be the warmest and driest place on the island, being in the lee of the prevailing winds. Subantarctic fur seals at Gough and Inaccessible Islands. Many of the flora and fauna of the archipelago have a broad circumpolar distribution in the South Atlantic and South Pacific Oceans. For example, the plant species Nertera depressa was first collected in Tristan da Cunha, but has since been recorded as far away as New Zealand. Tristan is primarily known for its wildlife. The island has been identified as an Important Bird Area by BirdLife International because there are 13 known species of breeding seabirds on the island and two species of resident land birds. The seabirds include northern rockhopper penguins, Atlantic yellow-nosed albatrosses, sooty albatrosses, Atlantic petrels, great-winged petrels, soft-plumaged petrels, broad-billed prions, grey petrels, great shearwaters, sooty shearwaters, Tristan skuas, Antarctic terns and brown noddies. Tristan and Gough Islands are the only known breeding sites in the world for the Atlantic petrel. Inaccessible Island is also the only known breeding ground of the spectacled petrel. The Tristan albatross is known to breed only on Gough and Inaccessible Islands: all nest on Gough, except for one or two pairs which nest on Inaccessible Island. The endemic Tristan thrush, also known as the "starchy", occurs on all of the northern islands and each has its own subspecies, with Tristan birds being slightly smaller and duller than those on Nightingale and Inaccessible. The endemic Inaccessible Island rail, the smallest extant flightless bird in the world, is found only on Inaccessible Island. In 1956, eight Gough moorhens were released at Sandy Point on Tristan, and have subsequently colonised the island. No birds of prey breed on Tristan da Cunha, but the Amur falcon occasionally passes through the area on its migrations, thus putting it on the island's bird list. Various species of whales and dolphins can be seen around Tristan from time to time with increasing sighting rates, although recovery of baleen whales, especially the southern right whale, were severely hindered by illegal whaling by the Soviet Union in the aftermath of the 1960 volcanic eruption. The subantarctic fur seal Arctocephalus tropicalis can also be found in the Tristan archipelago, mostly on Gough Island. The island has a unique social and economic structure in which all resident families farm and all land is communally owned. Outsiders are prohibited from buying land or settling on Tristan. Besides subsistence agriculture, major industries are commercial fishing and government. Major export industries are the Tristan rock lobster (Jasus) fishery, the sale of the island's postage stamps and coins, and limited tourism. Like most British Overseas Territories, it is not part of the European Union, but is rather a member of the EU's Overseas Countries and Territories Association. The Bank of Saint Helena was established on Saint Helena and Ascension Island in 2004. 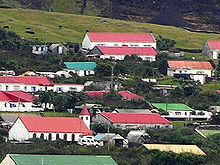 This bank does not have a physical presence on Tristan da Cunha, but residents of Tristan are entitled to its services. Although Tristan da Cunha is part of the same overseas territory as Saint Helena, it does not use the local Saint Helena pound, instead, using the United Kingdom issue of the pound sterling. The remote location of the islands makes transport to the outside world difficult. Tristan da Cunha has no airstrip and is not generally accessible to air travel, though the wider territory is served by Saint Helena Airport and RAF Ascension Island. Fishing boats from South Africa service the islands eight or nine times per year. The RMS Saint Helena used to connect the main island to St. Helena and South Africa once each year during its January voyage, but has done so only a few times in the last years, in 2006, in 2011, and most recently in 2018. The harbour at Edinburgh of the Seven Seas is called Calshot Harbour, named after the place in Hampshire where the islanders temporarily stayed during the volcanic eruption. Although Tristan da Cunha shares the +290 code with St. Helena, residents have access to the Foreign and Commonwealth Office Telecommunications Network, provided by Global Crossing. This uses a London 020 numbering range, meaning that numbers are accessed via the UK telephone numbering plan. Internet access was available in Tristan da Cunha from 1998 to 2006, but its high cost made it almost unaffordable for the local population, who primarily used it only to send email. The connection was also extremely unreliable, connecting through a 64 kbit/s satellite phone connection provided by Inmarsat. Since 2006, a very-small-aperture terminal has provided 3072 kbit/s of publicly accessible bandwidth via an internet cafe. There is not yet any mobile telephone coverage on the islands. DX-peditions are sometimes conducted in the island group by amateur radio operators. One was ZD9ZS in September–October 2014. There are no political parties or trade unions on Tristan. Executive authority is vested in the Queen, who is represented in the territory by the Governor of Saint Helena. As the Governor resides permanently in Saint Helena, an Administrator is appointed to represent the Governor in the islands. The Administrator is a career civil servant in the Foreign Office, selected by London, who acts as the local head of government and takes advice from the Tristan da Cunha Island Council. Since 1998, each Administrator has served a three-year term (which begins in September, upon arrival of the supply ship from Cape Town). Sean Burns began a second term as Administrator in November 2016. The Administrator and Island Council work from the Government Building, which is the only two-storey building on the island. The building is sometimes referred to as "Whitehall" or the "H'admin Building" and contains the Administrator's Office, Treasury Department, Administration Offices, and the Council Chamber where Island Council meetings are held. Policing is undertaken by one full-time police inspector and three special constables. Tristan da Cunha has some legislation of its own, but the law of Saint Helena applies generally to the extent that it is not inconsistent with local law, insofar as it is suitable for local circumstances and subject to such modifications as local circumstances make necessary. The Island Council is made up of eight elected and three appointed members, who serve a three-year term which begins in February or March. A separate but simultaneous vote is held to select the Chief Islander, who is the community’s political leader. James Glass was elected to the position in March 2019, returning after sixteen years to commence a record-breaking fourth term in the role. Tristan da Cunha recorded a population of 251 in the September 2018 census. The only settlement is Edinburgh of the Seven Seas (known locally as "The Settlement"). The only religion is Christianity, with the only denominations being Anglican and Roman Catholic. The current residents are thought to have descended from fifteen outside ancestors, eight male and seven female, who arrived on the island at various dates between 1816 and 1908. The men were European, and the women were mixed race and African. Now all of the population has mixed ancestry. In addition, a male contributor of eastern European/Russian descent arrived in the early 1900s. In 1963, when families returned after the evacuation due to the 1961 volcanic eruption, the 200 settlers included four Tristan da Cunha women who brought with them new English husbands. The female descendants have been traced by genetic study to five female founders, believed to be mixed-race (African, Asian and European descent) and from Saint Helena. The historical data recounted that there were two pairs of sisters, but the MtDNA evidence showed only one pair of sisters. The early male founders originated from Scotland, England, the Netherlands, the United States and Italy, and belonged to 3 Y-haplogroups: I (M170), R-SRY10831.2 and R (M207) (xSRY10831.2) and share nine surnames: Collins, Glass, Green, Hagan, Lavarello, Repetto, Rogers, Squibb and Swain. [n 1] In addition, a new haplotype was found that is associated with men of eastern Europe and Russia. It entered the population in the early 1900s, at a time when the island was visited by Russian sailing ships. There is "evidence for the contribution of a hidden ancestor who left his genes but not his name on the island." Another four instances of non-paternity were found among male descendants, but researchers believed their fathers were probably among the island population. There are eighty families on the island. Tristan da Cunha's isolation has led to development of an unusual, patois-like dialect of English described by the writer Simon Winchester as "a sonorous amalgam of Home Counties lockjaw and 19th century idiom, Afrikaans slang and Italian." Bill Bryson documents some examples of the island's dialect in his book, The Mother Tongue. Education is fairly rudimentary; children leave school at age 16, and although they can take GCSEs a year later, few do. The school on the island is St. Mary's School, which serves children from ages 4 to 16. It opened in 1975 and has five classrooms, a kitchen, a stage, a computer room, and a craft and science room. The Tristan Song Project was a collaboration between St. Mary's School and amateur composers in Britain, led by music teacher Tony Triggs. It began in 2010 and involved St Mary's pupils writing poems and Tony Triggs providing musical settings by himself and his pupils. A desktop publication entitled Rockhopper Penguins and Other Songs (2010) embraced most of the songs completed that year and funded a consignment of guitars to the school. In February 2013, the Tristan Post Office issued a set of four Song Project stamps featuring island musical instruments and lyrics from Song Project songs about Tristan's volcano and wildlife. In 2014, the project broadened its scope and continues as the International Song Project. Healthcare is funded by the government, undertaken at most times by one resident doctor. Surgery or facilities for complex childbirth are therefore limited, and emergencies can necessitate communicating with passing fishing vessels so the injured person can be ferried to Cape Town. As of late 2007, IBM and Beacon Equity Partners, co-operating with Medweb, the University of Pittsburgh Medical Center and the island's government on "Project Tristan", has supplied the island's doctor with access to long distance tele-medical help, making it possible to send EKG and X-ray pictures to doctors in other countries for instant consultation. There are instances of health problems attributed to endogamy, including glaucoma. In addition, there is a very high (42%) incidence of asthma among the population and research by Noe Zamel of the University of Toronto has led to discoveries about the genetic nature of the disease. Three of the original settlers of the island were asthma sufferers. Local television began in 1984 using taped programming on Tuesday, Thursday and Sunday evenings. Live television did not arrive on the island until 2001, with the introduction of the British Forces Broadcasting Service, which now provides BBC1, BBC2, ITV and BFBS Extra, relayed to islanders via local transmitters. BFBS Radio 2 is the locally available radio station. An official website is provided by the island government and the Tristan da Cunha Association, which maintains it from the UK. A community newsletter, Village Voice, is produced each week. The island holds an annual break from government and factory work which begins before Christmas and lasts for three weeks. The beginning of the holiday, called Break-Up Day, is usually marked with parties and celebrations. Edwin Heron Dodgson (1846–1918), a clergyman in the Church of England, was the youngest brother of Charles Lutwidge Dodgson (Lewis Carroll), author of Alice's Adventures in Wonderland. He is primarily remembered for his work as a missionary in the island of Tristan da Cunha from 1880 to 1884. Conrad "Connie" Glass MBE (born 1961) is a Tristanian police officer and a former Chief Islander. He lives on Tristan da Cunha and is the first islander to have written a book about it, Rockhopper Copper (2005). South African poet Roy Campbell wrote "Tristan de Cunha" (1927), an elegiac poem about the island. Alice Munro's short story Deep-Holes in her 2009 short story collection Too Much Happiness. The female protagonist, a mother, confides to her young son about her fascination with remote islands like Tristan da Cunha and the Faroe Islands. Later, when her son goes missing, she fantasises that he has found his way to one of these islands and is living there. Arne Falk-Rønne, a Danish travel writer, recorded his impressions of the islands in Back to Tristan (UK: George Allen & Unwin Ltd., 1967), an English translation of Falk-Rønne‘s original volume in Danish, Tilbage til Tristan (1963). ^ These names are thought to have been immigrants who were Scottish; Dutch; English; Irish; Italian (prob. Ligurian); Italian (prob. Ligurian); Scottish; English; and English, respectively. Briefly there was a resident by surname Patterson on the island. Weaver, Barry (2003). "Tristan da Cunha". College of Atmospheric & Geographic Sciences, University of Oklahoma. Archived from the original on 10 June 2007. ^ "Tristan da Cunha Chief Islander". Tristan da Cunha Government & Tristan da Cunha Association. Archived from the original on 23 June 2014. Retrieved 11 October 2017. ^ Crawford, Allan (1982). Tristan da Cunha and the Roaring Forties. Charles Skilton. p. 20. Retrieved 13 August 2013. ^ a b c d "Tristan da Cunha Family News". Archived from the original on 5 December 2016. Retrieved 22 January 2017. ^ a b "Census 2016 – summary report" (PDF). St Helena Government. June 2016. p. 9. Archived (PDF) from the original on 17 October 2016. Retrieved 23 January 2017. ^ a b Winkler, Sarah (25 August 2009). "Where is the Most Remote Spot on Earth? Tristan da Cunha: The World's Most Remote Inhabited Island". How Stuff Works. Retrieved 28 December 2018. ^ Rosenberg, Matt (6 March 2017). "Tristan da Cunha: The World's Most Remote Island". ThoughtCo. Retrieved 28 December 2018. ^ a b "The St Helena, Ascension and Tristan da Cunha Constitution Order 2009". The National Archives. 2009. Retrieved 5 January 2019. ^ a b c "Arnaldo Faustini. The Annals of Tristan da Cunha" (PDF). Archived (PDF) from the original on 10 May 2015. Retrieved 28 December 2018. ^ a b Headland, J.K. (1989). Chronological List of Antarctic Expeditions and Related Historical Events. Cambridge: Cambridge University Press. Retrieved 28 December 2018. ^ a b c Mackay, Margaret (1963). Angry Island: The Story of Tristan da Cunha, 1506–1963. London: Arthur Barker. p. 30. ^ "Tristan d'Acunha, etc. : Jonathan Lambert, late Sovereign thereof". Blackwood's Edinburgh Magazine. 4 (21): 280–285. Dec 1818. ^ a b Roberts, Edmund (1837). Embassy to the Eastern Courts of Cochin-China, Siam, and Muscat. New York: Harper & Brothers. p. 33. Archived from the original on 12 October 2013. Retrieved 11 October 2013. ^ Courtney, Nicholas (2004). The Queen's Stamps. ISBN 0-413-77228-4, page 28. The visit took place during the Duke of Edinburgh's circumnavigation undertaken while commanding HMS Galatea. Tristan da Cunha post office issued four stamps in 1967 to celebrate the centenary of this visit. ^ Thomson, C. Wyville (1885). Report on the Scientific Results of the Voyage of H.M.S. Challenger During the Years 1873–76. London: Her Majesty's Stationery Office. pp. 240–52. Retrieved 28 December 2018. ^ "H.M.S. Challenger Station 135, Tristan da Cunha". Retrieved 29 August 2016. ^ "Tristan da Cunha Isolation & Hardship 1853–1942". Tristan da Cunha Government & Tristan da Cunha Association. Retrieved 1 January 2019. ^ "Tristan da Cunha Stamps". Tristan da Cunha. 8 December 2015. Retrieved 2 January 2019. ^ Millington, Peter. "Tristan da Cunha News: 1920s Lantern Slides of Tristan for Sale on eBay". Tristan da Cunha. Retrieved 2 January 2019. ^ Lawrence, Nigel (8 August 2017). "Tristan Da Cunha". Shipping Today & Yesterday Magazine. Retrieved 2 January 2019. ^ "Sale 4010 - Web/Internet - Outgoing Ship Mail". Daniel F. Kelleher Auctions LLC. Retrieved 2 January 2019. ^ Wollenberg, Ken (2000). "Chapter XI: Tristan da Cunha". The Bottom of the Map. Bloomington, Indiana: Xlibris. Retrieved 28 December 2018. ^ "Results of the Norwegian Scientific Expedition to Tristan da Cunha, 1937–1938". OUR Heritage. University of Otago. 1945. Archived from the original on 29 September 2015. Retrieved 3 June 2015. ^ Evans, Andrew (22 April 2011). "Holy Grail". National Geographic. Retrieved 2 January 2019. ^ Foran, W. Robert. "Tristan da Cunha, Isles of Contentment." National Geographic, November 1938, pp. 671–94. ^ "Royal Gifts Gladden 172 on Lonely Atlantic Island". The New York Times. New York, NY. 24 March 1935. second news section, p. N4. Archived from the original on 27 January 2012. Retrieved 15 October 2008. ^ "Tristan da Cunha Joining the Modern World 1942–1961". Tristan da Cunha. Retrieved 28 December 2018. ^ "hrh the duke of edinburgh's antarctic tour. january 1957". Imperial War Museum. Archived from the original on 2 July 2018. Retrieved 2 July 2018. ^ "Tristan da Cunha". Global Volcanism Program. Smithsonian Institution. Retrieved 28 December 2018. ^ a b "Travel Tristan da Cunha". Archived from the original on 11 September 2016. Retrieved 29 August 2016. ^ Gila, Oscar Alvarez. "Refugees for the media, evacuees for the government: The 1961 Tristan da Cunha volcano eruption and its displaced inhabitants". Global Change and Resilience. From Impacts to Responses, Brno, Czech Globe. ^ "Gough Island". Ramsar Sites Information Service. Retrieved 25 April 2018. ^ "Inaccessible Island". Ramsar Sites Information Service. Retrieved 25 April 2018. ^ Barwick, Sandra (7 June 2001). "120 mph storm devastates Tristan da Cunha". The Daily Telegraph. London, UK. Archived from the original on 22 May 2018. Retrieved 4 April 2018. ^ "Factory Fire on 13th February 2008". The Tristan da Cunha Website. Retrieved 5 January 2019. ^ "Building a 21st Century Tristan Fishing Factory". The Tristan da Cunha Website. Retrieved 5 January 2019. ^ "MS Oliva runs aground on Nightingale Island". The Tristan da Cunha Website. Archived from the original on 25 May 2011. Retrieved 23 March 2011. ^ "Oil-soaked rockhopper penguins in rehabilitation". BBC News. Archived from the original on 3 September 2013. Retrieved 28 March 2011. ^ "Total Solar Eclipse of 2048 December 05". Eclipse.gsfc.nasa.gov. Archived from the original on 11 January 2014. Retrieved 11 January 2014. ^ Rosenberg, Mark (6 March 2017). "Tristan da Cunha". ThoughtCo. Retrieved 5 January 2019. ^ "Gough Island". South African National Antarctic Programme. Archived from the original on 30 December 2008. Retrieved 25 October 2012. ^ "Tristan da Cunha Gough Island". Tristan da Cunha. Retrieved 5 January 2019. ^ "ZD9A Gough Island". DX News. 23 June 2016. Retrieved 5 January 2019. ^ "Tristan da Cunha Sandy Point". Tristan da Cunha. Retrieved 5 January 2019. ^ "South Africa: Tristan Da Cunha". March 2012. Archived from the original on 26 April 2015. ^ "Tristan Da Cunha Climate Guide to the Average Weather & Temperatures with Graphs Elucidating Sunshine and Rainfall Data & Information about Wind Speeds & Humidity". March 2012. Archived from the original on 17 November 2011. ^ "Tristan da Cunha's Climate". ^ Brown, R. N. Rudmose (1905). "The Botany of Gough Island". The Journal of the Linnean Society of London. 37 (259): 238–250, page 242. doi:10.1111/j.1095-8339.1905.tb00834.x. ^ Hogan, C. Michael (2009). Stromberg, N., ed. "Crown Fern: Blechnum discolor". Globaltwitcher.com. Archived from the original on 13 February 2012. ^ "Important Bird Areas factsheet: Tristan Island". Important Bird Areas. BirdLife International. 2012. Retrieved 28 December 2018. ^ BirdLife International. "Spectacled Petrel - BirdLife Species Factsheet". Data Zone. Retrieved 5 January 2019. ^ "Tristan Albatross (Diomedea dabbenena)". BirdLife Data Zone. Retrieved 5 January 2019. ^ "Gough Moorhens". Beauty of Birds. Retrieved 5 January 2019. ^ "Cetacea: Whales and Dolphins around the Tristan da Cunha Islands". The Tristan da Cunha Website. Tristan da Cunha Government and the Tristan da Cunha Association. Archived from the original on 13 April 2016. ^ Tyler, P. and A. Rothwell. "The Natural History of Tristan da Cunha" (PDF). UK Overseas Territories Conservation Forum. UK Overseas Territories Conservation Forum. Archived from the original (PDF) on 27 May 2015. Retrieved 30 June 2016. ^ Tristan da Cunha Government and the Tristan da Cunha Association (June 2005). "Economy of Tristan da Cunha". Tristan da Cunha Government and the Tristan da Cunha Association. Archived from the original on 26 May 2012. Retrieved 12 March 2008. ^ "OCTA Presentation". octassociation.org. Retrieved 11 October 2017. ^ "The Bank of Saint Helena". Sainthelenabank.com. Archived from the original on 15 July 2011. Retrieved 18 April 2010. ^ "Tristan da Cunha Coins". The Tristan da Cunha Website. Retrieved 5 January 2019. ^ Matzka, Jürgen (20 November 2008). "Danish researchers build magnetic observatory in the middle of the Atlantic Ocean". Technical University of Denmark. Archived from the original on 8 May 2014. ^ "Building St. Helena Airport". Archived from the original on 14 October 2017. Retrieved 14 October 2017. ^ "St. Helena: Flights to remote Atlantic island begin at last". BBC. Archived from the original on 14 October 2017. Retrieved 14 October 2017. ^ "Ascension Island Travel Company". Archived from the original on 26 November 2015. Retrieved 26 November 2015. ^ "Last Voyage to Tristan by the RMS St. Helena". ^ "Tristan da Cunha's Calshot Harbour". Archived from the original on 12 May 2015. Retrieved 14 August 2015. ^ "Tristan Da Cunha Contact Information". Archived from the original on 2013-06-16. ^ "Telecommunications expert sets the record straight: Internet access is too expensive for Tristan da Cunha". Tristan da Cunha News. 11 August 2005. Archived from the original on 4 December 2014. Retrieved 28 November 2014. ^ "Tristan da Cunha communications news". Archived from the original on 20 July 2015. Retrieved 14 August 2015. ^ "Tristan da Cunha's Development and Public Works". Tristan da Cunha Government & Tristan da Cunha Association. 6 October 2016. Archived from the original on 30 April 2018. Retrieved 18 November 2018. ^ "ZD9ZS Tristan da Cunha Island". DX News. 9 September 2016. Retrieved 5 January 2019. ^ "ZD9ZS – Tristan da Cunha". DX-World. 22 August 2014. Retrieved 5 January 2019. ^ "ZD9XF - ZD9ZS : Tristan da Cunha : Sep 2014". G3TXF. 9 September 2016. Retrieved 5 January 2019. ^ "Saint Helena Dependencies". Statoids.com. Archived from the original on 11 October 2010. Retrieved 18 April 2010. ^ "Tristan da Cunha Administrator". Tristan da Cunha. Retrieved 5 January 2019. ^ "Tristan da Cunha Government". Tristan da Cunha. Retrieved 5 January 2019. ^ a b c Rosenberg, Matt (6 March 2018). "Tristan da Cunha". ThoughtCo. Retrieved 2 January 2019. ^ a b c d 1911 Encyclopædia Britannica. 27. 1911. p. 295. ^ "Tristan da Cunha Isolation & Hardship 1853 - 1942". Tristan da Cunha. Tristan da Cunha Government & Tristan da Cunha Association. Retrieved 2 January 2019. ^ "Can You Tell— - Answers to Yesterday's Questions". Dundee Evening Telegraph. 24 May 1934. p. 7. Retrieved 3 January 2019. When the French training cruiser, Jeanne d'Arc, recently called at Tristan da Cunha, there were 167 inhabitants living in 40 low-built thatched cottages. ^ The Great Soviet Encyclopedia, 3rd Edition. 1970–1979. ^ a b c "ST. HELENA, ASCENSION AND TRISTAN DA CUNHA". City Population. 6 March 2018. Retrieved 2 January 2019. ^ a b "Tristan Da Cunha". Encyclopedia.com. The Columbia Encyclopedia, 6th ed. Retrieved 2 January 2019. ^ The Columbia Electronic Encyclopedia. Columbia University Press. 2013. ^ "Tristan da Cunha Families: Population Update". Archived from the original on 22 August 2018. Retrieved 24 September 2018. ^ Munch, Peter (1970). Crisis in Utopia. New York: Longmans. p. 55. ISBN 978-0582105119. ^ Soodyall, H.; Jenkins, T.; Mukherjee, A.; Du Toit, E.; Roberts, D. F.; Stoneking, M. (1997). "The founding mitochondrial DNA lineages of Tristan da Cunha Islanders". Am. J. Phys. Anthropol. 104 (2): 157–166. doi:10.1002/(SICI)1096-8644(199710)104:2<157::AID-AJPA2>3.0.CO;2-W.
^ "Ultimate Remote Tourist Destination: Tristan da Cunha". Sometimes Interesting. 14 March 2012. Retrieved 5 January 2019. ^ Winchester, Simon (2003) [originally published 1985]. Outposts: Journeys to the Surviving Relics of the British Empire. p. 87. ISBN 9780141011899. Archived from the original on 25 December 2016. Retrieved 25 December 2016. ^ Crossan, Rob (11 November 2002). "Return to the Last Outpost". Telegraph Magazine. ^ "CNN Traveler: A long way from anywhere". Cnntraveller.com. 1 January 2007. Archived from the original on 29 May 2008. Retrieved 18 April 2010. ^ "Tristan School". Tristan da Cunha Government and the Tristan da Cunha Association. Archived from the original on 25 March 2009. Retrieved 21 June 2009. ^ Bulger, Gerald (11 January 2012). "The most isolated UK GP in the world". GP Online. Archived from the original on 24 December 2016. Retrieved 23 December 2016. ^ "IBM Connects World's Most Remote Island to Healthcare". Diagnostic and Interventional Cardiology. 14 November 2007. Retrieved 5 January 2019. ^ Winchester, Simon (2003) [originally published 1985]. Outposts: Journeys to the Surviving Relics of the British Empire. p. 85. ^ "Tristan da Cunha Community News 2005 - 2011". Tristan da Cunha. Retrieved 6 January 2019. ^ "2013/14 Tristan da Cunha Summer Holiday Christmas and New Years News". Archived from the original on 29 December 2013. Retrieved 29 January 2014. ^ "Wings of Desire (1987)". IMDb. Archived from the original on 28 March 2017. Retrieved 15 September 2018. ^ "37°4 S (2013)". IMDb. Archived from the original on 12 February 2017. Retrieved 25 October 2018. ^ Poe, Edgar Allan (1838). The Narrative of Arthur Gordon Pym/Chapter 15 – via Wikisource. ^ Verne, Jules (1867–68). In Search of the Castaways; or Captain Grant's Children/Chapter XXVIII – via Wikisource. ^ Tristan Times (14 March 2005). "Tristan : Rockhopper Copper set to Hit Bookshelves". Tristan Times. Archived from the original on 23 June 2014. Retrieved 5 April 2014. A Short Guide to Tristan da Cunha by James Glass and Anne Green, Tristan Chief Islanders (2005, Whitby Press, 12 pages). Field Guides to the Animals and Plants of Tristan da Cunha and Gough Island Edited by Peter Ryan (2007, RSPB Publication, 168 pages). Gough Island: A Natural History by Christine Hanel, Steven Chown and Kevin Gaston (2005, Sun Press, 169 pages). Crawford, Allan (1982). Tristan Da Cunha and the Roaring Forties. Anchor Press. ISBN 978-0-2849-8589-7. Tristan da Cunha: History, People, Language by Daniel Schreier and Karen Lavarello-Schreier (2003, Battlebridge, 88 pages). Rockhopper Copper: The life and times of the people of the most remote inhabited island on Earth by Conrad Glass MBE, Tristan Police Officer (2005, Polperro Heritage Press, 176 pages). Recipes from Tristan da Cunha by Dawn Repetto, Tristan Tourism Co-ordinator (2010, Tristan Books, 32 pages). Corporal Glass's Island: The Story of Tristan da Cunha by Nancy Hosegood (1966, Farrar, Straus, Giroux, 192 pages, with several pages of photographs). Three Years in Tristan da Cunha by Katherine Mary Barrow (1910, Skeffington & Son, 200 pages, with 37 photographs). Wikimedia Commons has media related to Tristan da Cunha. Wikivoyage has a travel guide for Tristan da Cunha. "Tristan da Cunha" . Encyclopædia Britannica. 27 (11th ed.). 1911. LIFE Magazine article about 1961 evacuation. Return to Trista da Cunha, Global Nomad, National Geographic (2012). A Day on Tristan da Cunha, Global Nomad, National Geographic (2011). Tristan da Cunha: The story of Asthma Island, part 1 and part 2, BBC Four (2008). Tristan da Cunha: Life on the island in 1963 (1963). Tristan da Cunha: Life of an islander in 1963 (1963).